North Georgia Speedway is billed as the fasted 1/3-mile in the South. 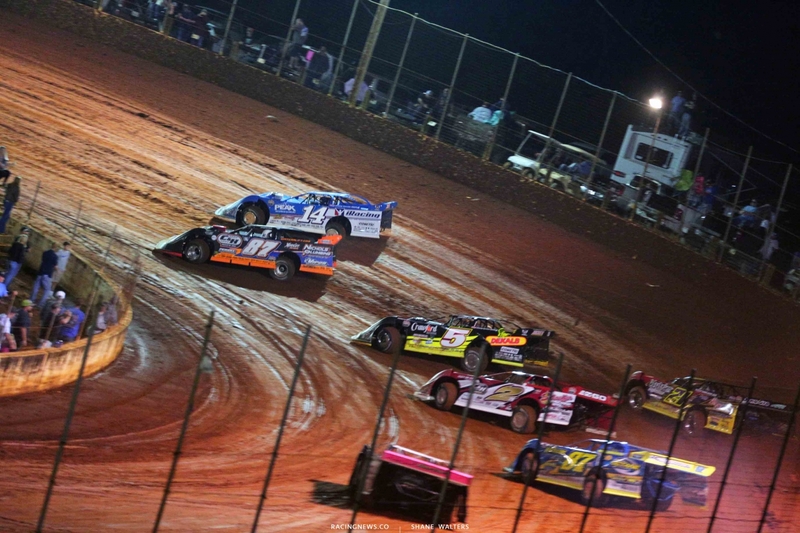 Tonight, the Chatsworth, Georgia race track hosts the Lucas Oil Late Model Dirt Series. 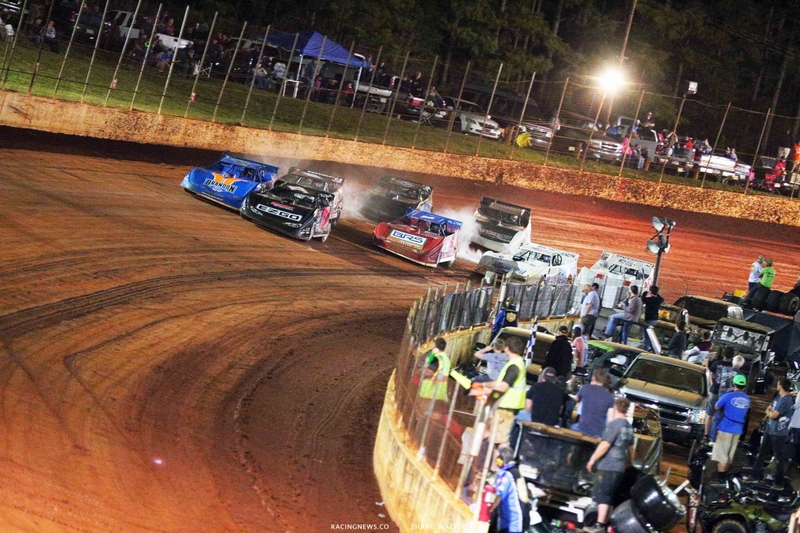 View full 2019 North Georgia Speedway results below. Big problem for Shanon Buckingham. He drove it into turn three on his first lap in qualifying and the entire rear end shifted out of place. He’s lost drive as well as a chance to turn a lap. Ross Bailes was quickest in group A qualifying. David Payne was fastest overall in group B.
Ross Bailes and Josh Richards set the front row for the first heat race of the night. Green, Bailes gets right on the entry. He jumps back in the throttle, it jumps sideways. Jameson is tangled behind them, the caution is out. Restart, Bailes hangs Richards in turn one. He runs wide in turn three and falls to 4th. Bailes doors Overton. Overton returns the door in turn three. Bailes loops it in turn three. Bailes stops in turn three. He waves Overton down. They talk it out from each others cockpits during the yellow. Overton has stalled, he cant retire. Overton is going off on the hook. Green, Richards is gone. He’s setting track record pace in a heat race! Richards takes the win in the first heat of the night. He’ll start from the pole later tonight. Dale McDowell and Kyle Bronson trial the pace truck in heat two. Green, McDowell leads into turn one. Four cars crash behind them and the caution is back out. Restart, McDowell leads. Moran is on his bumper. Moran was hanging with him for a few laps. McDowell starts to pull away. McDowell takes the win in heat two! David Payne and Aaron Ridley line up first in heat three. Green, Payne leads into turn one. McCreadie is muscling his way to the front. He climbs to 2nd with light door to door contact. McCreadie is hanging with the leader but he’s not closing. Payne takes the win in heat three! Jonathan Davenport and Will Roland head to the starting stand in heat four. Green, Davenport leads. Ryan King slides into turn one and picks up two positions. King moves to 2nd. They stacked up the field but they all continue. Davenport opens a gap. Tyler Erb moves to 2nd. He’s running down Davenport. Lap 8, the caution is out. It’s going to be a short shootout. Green, Davenport leads Erb. Davenport pulls away to win the final heat race of the night! Someone is heading home with a check for $12,000. The field forms a four wide salute for the Georgia dirt racing fans. Josh Richards and David Payne set the front row. The 50-lap main event is next. Green flag, Richards leads on the bottom in turn one. He runs wide off turn two. Payne takes the lead. Richards falls out side the top 5. There must have been contact but I missed it. Lap 6, the yellow is out. Lap 15, Moran is all over Davenport for 2nd. Most of the field runs the bottom in turn one. Moran can pull to his number but can’t find a way by. Lap 17, the yellow is back out. Green, Davenport is running higher in turn one. He opens a gap to Moran and he’s on the bumper of the leader. Davenport takes the lead! Lap 20, spin in turn two. The caution is back out. Green, Davenport leads. Moran takes 2nd. Ryan King gets crossed up into turn two. The caution is back out. Owens heads to the pits. Green, Davenport leads. Moran holds 2nd. McCreadie runs three wide through the middle to pick up two spots. Payne grabs 2nd from Moran. Payne is slow in turn three! He has a flat left rear and the caution is back out. Green, Four car pile up in turn two. King, Owens and Payne are amoung those collected. Green, Davenport leads. Moran holds 2nd. Lap 34, Tyler Erb has a run off turn four, he takes 2nd away. Moran smacks a rut on the high side of turn one. The car nearly rolled but he keeps it going. Tyler Erb is around on his own in turn two! The caution is out. Green, Don O’Neal to 2nd. Davenport opens the gap in a hurry. The caution is back out. The track is fast and rough tonight. Its causing a lot of wrecks and mechanical issues. Green, trouble for Bronson in turn one. The caution flag returns. 11 laps to go. Green, Davenport leads. Owens holds 2nd. Lap 42, Owens is around in turn three. The yellow waves. Green, Davenport opens the gap quick. He’s on cruise control around the top in turn three. Davenport wins at North Georgia Speedway! It’s a home state win for the point leader. 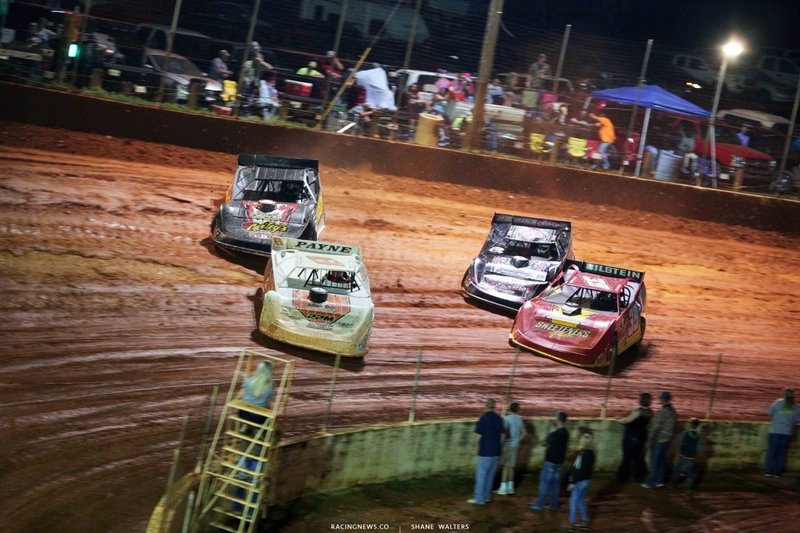 View full 2019 North Georgia Speedway results from Seymour, Tennessee below.